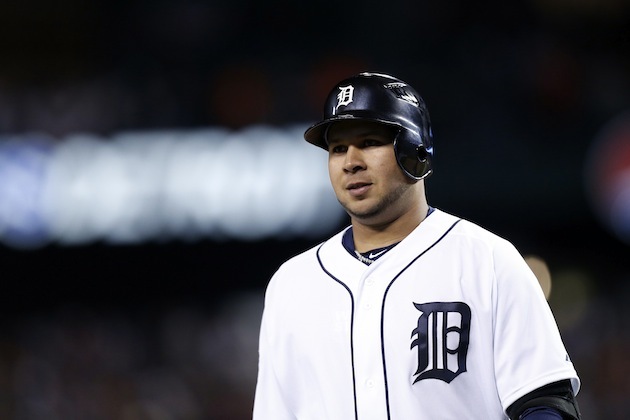 Should The Tigers Bring Peralta Back for The Playoffs? Very shortly, the Tigers are going to have to decide whether or not they’ll bring Jhonny Peralta back for the postseason. We’re three weeks from the end of the season and Peralta will presumably require some time to get himself back into game shape. The conversations are happening now, I would imagine, and we should know in the near future. Let’s assess the arguments for and against. There are two primary arguments against bringing Peralta back for the playoff run. First, Peralta’s skills might have atrophied over the course of the fifty game suspension such that he won’t be able to contribute above what a player like Ramon Santiago could. This is entirely possible, but it would require some sort of evaluation in order to believe. Peralta was crushing the ball before the suspension and there is no reason to think the 2013 season was PED aided, so the case would have to be made that he is out of game shape and the only way that case could be made would be to test him with baseball activities and simulated games. If Peralta was on the DL and not suspended, the Tigers would make every effort to get him ready for October even if he missed the same number of games. The other argument against Peralta coming back is personal. It’s possible that the team is angry with him and wouldn’t be receptive to his presence in the clubhouse. Other than Scherzer, most of the Tigers kept their heads down about Biogenesis and Scherzer tempered his reaction once the full story on Peralta came to light. On top of that, the word is that Peralta was extremely well liked within the organization. I’m open to the idea that his presence could negatively affect the team, but the reactions to his suspension suggests that won’t be the case. The Tigers are a practical and forgiving organization. So the case against Peralta hinges on two issues. Can he still contribute and would his presence create a hostile environment? We’ll revisit those questions shortly. Assuming the Peralta wouldn’t shake up the clubhouse, the case to bring him back is based on how well he can play. Entering the suspension, Peralta had what is still the second highest WAR (what’s WAR?) on the team at 3.6. He hit .305/.361/.461. Among the full time guys, only Cabrera has a higher OBP and SLG. Peralta has also been an above average defender for three years running now, although he is clearly no Iglesias in that regard. His value is predicated on his ability to hit and entering the suspension he was one of the best hitting shortstops in baseball. The league average shortstop hits 15% worse than league average and Peralta hit 25% better in 2013. The argument isn’t really whether or not Peralta will be better than Iglesias in the postseason, the questions is if he is one of the 14 best position players in the organization. It’s hard to make the case that even after 50 games off he wouldn’t at least be better than Santiago or Tuiasosopo. If you leave Iglesias at short and Dirks in left, you have five bench spots to use. One is for Pena, obviously, and you need at least one backup outfielder, but it’s hard to make the case that there are three other Tigers you’d rather have on your bench. In reality, he’s probably better than Iglesias, but that is still up for debate considering defense and time off, but he’s certainly better than Santiago, Tui, Kelly, and company. No doubt, no question. So it comes down to this. If the Tigers players view Peralta as a clubhouse cancer, then it’s reasonable to say thanks but no thanks when it’s time to set the playoff roster. But short of that, the Tigers must include him. The Tigers don’t owe it to Peralta – who dug this hole himself – they owe it to everyone else. The players worked too hard and the fans have given too much not to put the best 25 guys on the roster. It’s perfectly reasonable to say that after this break Peralta won’t be as productive as Iglesias overall, but when the opposing manager brings in a left-handed reliever to face Andy Dirks in the 7th inning of a 2 run game, do you want to go with Tuiasosopo or Jhonny Peralta? In the World Series, when you need to pinch hit for the pitcher, do you want to call on Avila or do you want Jhonny Peralta? Even a lesser version of Peralta is a better bat off the bench than most of the options the Tigers have. Even if the time off has hurt his skills, it certainly didn’t diminish them to the point that he can’t be a productive postseason pinch hitter. This isn’t a fringe player, this is a guy who was and still is the Tigers second best player in 2013. If you’re going to go all in like the Tigers have for a title, you can’t leave this weapon in the shed. This isn’t the time to make a stand on morality – a stand the Tigers didn’t make when Miguel Cabrera was arrested during the final weekend of the 2009 season. Peralta will have served his time and the Tigers are lined up for their best chance at a parade since 1984. You have to use him even if you don’t start him. If Iglesias or Infante or Cabrera get hurt in October, surely you would want him then. And you can’t ask him to be ready out of nowhere on October 9th, you have to start now. The practical thing to do is to get him working back into game shape and bring him along as a reserve.